The bronze turkey is the closest in colouring to the Eastern Wild. 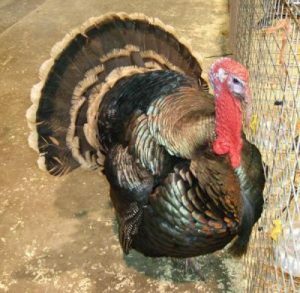 It is the most popular variety of turkey there is and a good Bronze is difficult to beat at exhibitions. The Bronze was further developed in England and re-introduced to the Americas where it became extremely popular. There are far fewer standard Bronzes than Broad-breasted (meat) Bronzes. Eyes: Iris, a dark hazel, pupil blue-black. Plumage of both sexes a good metallic bronze throughout. Back: From neck to middle of back – a rich copperish bronze, each feather terminating in a narrow black band, extending across end. From middle of back to tail coverts – black, each feather having a broad, copperish bronze band extending across it near the end, the feathers ending in a distinct black band, gradually narrowing as the tail coverts approached. Tail: Main tail and coverts – dull black each feather evenly and distinctly marked transversely with parallel line of brown; each feather having a bronze band extending across the feather, bordered on each side by a distinct band of intense black; the feather terminating in a wide edging of white. Wings: Shoulder and wing bow coverts – rich copperish bronze, ending in a narrow band of black; coverts, rich bronze, forming a broad band across wings when folded, feathers terminating in a black band, separating them from the secondaries. Primaries, each feather alternately crossed with distinct parallel black and white bars of equal width; flight coverts, barred similar to primaries; secondaries, dull black, alternately crossed with distinct parallel black and white bars, the black bar taking on a bronze cast on the shorter top secondaries and the white bar becoming less distinct. Breast: Exposed surface of feathers rich bronze, unexposed parts black. Each feather on lower part of breast approaching body terminating in a narrow black band extending across the end. Body and Fluff: Body black, each feather with a wide bronze band extending across it at the end, a narrow band of black bordering the bronze and terminating in a narrow edging of pure white. Fluff, a dull black. Legs and Feet: thighs: dull black with slight edgings of greyish white. Shanks and toes – dull black but changing to horn with maturity. As male, but with faint white lacing on the breast. The head is light brown with dark brown blotches and streaks. The neck and back have a broader dark streak down the centre with narrower streaks on either side. The wings have two dark streaks in the centre and a dark spot near the tip. The underneath of the poult is a yellowish white on the surface and pale grey beneath. The legs and feet are mainly flesh coloured with some smoky pigmentation below.